The northern highlands of the Guanacaste region extend all the way north towards its shared border with Nicaragua and journeys south beyond Tamarindo on the coast. All along the coastal province here one will see thriving high end development from exclusive resorts and five star hotels to luxury villas and fantastic shopping. Some of the corner stone hotel names who have made their mark on the area include the Four Seasons, Mandarin Oriental, the Jack Parker Corporation, Miraval Resorts, JW Marriott, the Hilton and many more. Costa Rica\'s second International airport located in Liberia, in many cases, is just a 30 minute drive away to several pristine white sand, pink and black sand beaches. A drier climate is common here making it an ideal retirement location for many foreigners and Costa Ricans alike. Many world class services are found in this region including a brand new state-of-the-art hospital, a branch of CIMA based in San Jose, which offers professional health care at much lower costs than in the United States or in Europe... a sure plus and peace of mind to many who have relocated to the area. Herein features large raw land opportunities for sale suitable for hotel/ resort development. Also included are several established Boutique Hotels for sale that are either currently producing well or have great potential for future growth. Not all of our listings are featured here so please email us with your specific request related to these categories only: prime beach front land or Boutique Hotels in the Guanacaste. 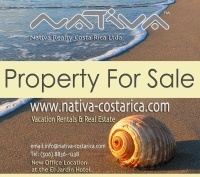 Sincerely, Nativa Realty Costa Rica Ltda.